Here's my last movie recommendation, at least for a little while. 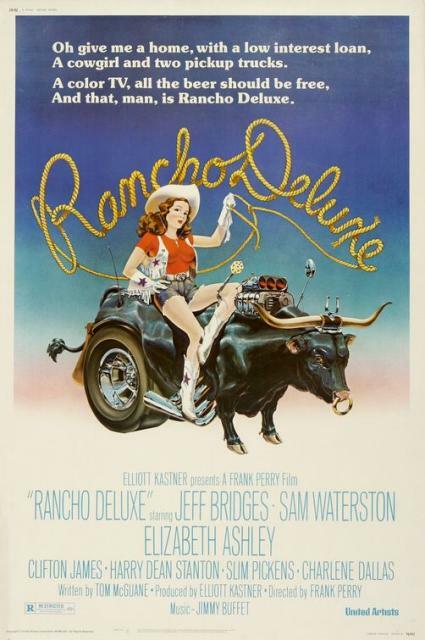 Rancho Deluxe is a weird little black comedy written by Tom McGuane and released in 1975. It stars Jeff Bridges and Sam Waterston as a pair of hapless drifters who take up cattle rustling (with a chainsaw!) down in the Paradise Valley. The film didn't get great reviews, and it's definitely a little uneven ... but it's a fun period piece with lots of Montana scenery. And it's got a Jimmy Buffett soundtrack, to boot! That's worth the price of admission by itself.